ASTANA. KAZINFORM - Ambassador of Kazakhstan in India and in the Kingdom of Bhutan with concurrency Bulat Sarsenbayev met with the Chairman of the National Council (Upper House) of the Kingdom of Bhutan Tashi Dorji and the Speaker of the National Assembly (Lower House) of the Kingdom of Bhutan Wangchuk Namgyel. Kazakh diplomat conveyed to the Bhutan side invitations to take part in the 4th Meeting of Speakers of Eurasian Parliaments on the topic "Greater Eurasia: Dialogue. Trust. Partnership" to be held on 23-24 September 2019 in Astana. Noting that work through parliamentary diplomacy is one of the important directions of the Foreign Ministry of Kazakhstan, Bulat Sarsenbayev discussed the prospects for cooperation between the legislative bodies of the two countries. The parties emphasized the need to intensify inter-parliamentary diplomacy. For his part, the Speaker of the National Assembly Wangchuk Namgiel assured that the received invitation will be carefully considered and a positive decision will be taken shortly. 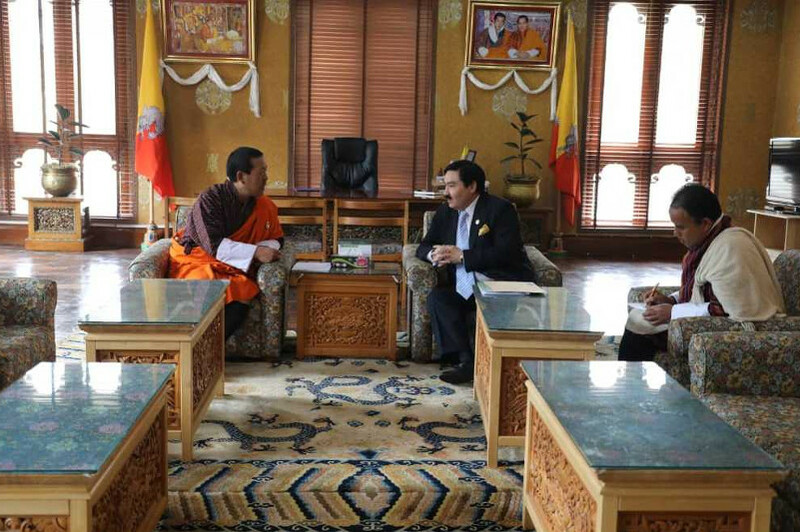 Bulat Sarsenbayev also met with the Director of SAARC and regional organizations of the Foreign Ministry of Bhutan Tashi Yoedling, wherein he discussed the prospects for strengthening bilateral relations between the two countries. In addition, during the meetings, the Ambassador informed the interlocutors that on 19 March of this year the President of Kazakhstan Nursultan Nazarbayev in his televised address to the people announced the resignation of the head of state. At the same time, he noted that, after leaving the presidency Nursultan Nazarbayev will retain three important posts: the Chairman of the Security Council; Head of the Assembly of the People of Kazakhstan; Member of the Constitutional Council. In addition, he remains as the Chairman of the ruling "Nur Otan" party. He also said that today, in accordance with the Constitution of Kazakhstan, Kassym-Jomart Tokayev, who until now has been the Chairman of the Senate of the Parliament of the Republic of Kazakhstan, took the oath and assumed the office of President of Kazakhstan. It was stressed that with the departure of President Nursultan Nazarbayev, the foreign policy of Astana will remain unchanged. Kazakhstan will continue to firmly committed to its international obligations. In turn, the political figures of Bhutan highly appreciated the role of Nursultan Nazarbayev in the formation of the Republic of Kazakhstan as an independent state and the strengthening of its economy, as well as the welfare of the people. In their opinion, he is a charismatic leader who has laid a solid foundation for stability and harmony in Kazakhstan's society. He was able to turn Kazakhstan into a stable, peaceful, tolerant and secular state with a fast-growing economy, which was recognized by the world community through its foreign policy initiatives.